Well here I am, definitely earlier than last week, when I made my card just before going to the theatre and 3 hours before the deadline. When I got back and saw I had 2 comments I thought it was Lady and Diva Lim but it was 2 of my lovely followers and there was no chance of any more because I forgot to link it to the Lim blog. Here's hoping I remember this week!!! Well the challenge is White on White and the entries are beautiful! 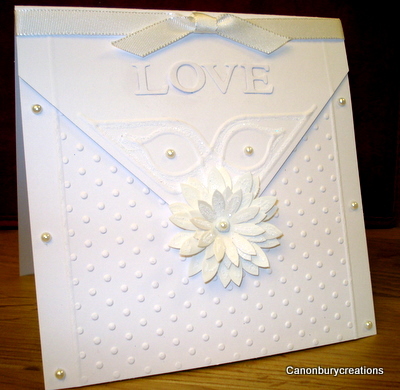 I chose a white card, obviously, and decided to make an envelope card. I embossed the flap and attached it to the tent card which I had embossed with dots in the cuttlebug. I made a large flower from some diecuts that Jacki had given me and glittered them and added a pearl brad in the centre.I added a ribbon across the top and some pearls and cut out some letters in my cuttlebug and attached them under the knot. Valeria, this is beautiful!!! I've never made an envelope card. Might have to give it a try! This is beautiful Valerie, it looks stunning. What make is the alphabet you used? I hope you have a wonderful time in France! This is stunning! I love the envelope effect and the gorgeous texture in your card. Sweet flower and pearls too! Have a great time in France - enjoy the wine, sun and book, and being with your OH!! Beautiful card very very classy indeed and so perfectly executed. I think I have dropped a clamber and posted on another blog of yours a thankyouy for the stylish blogger award have left a link to the other one so so sorry. This is a gorgeous card, very elegant looking. Love the shape of this card, very effective! So Stylish and totally White on White. beautiful card!! enjoy your trip! 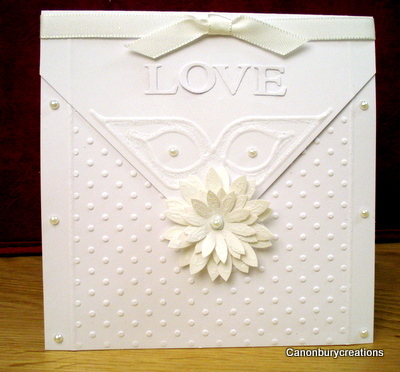 Gorgeous card, love the envelope style! Very elegant and lovely!! Have a safe trip! !